This is the trip report of our Dreamland Resort Tikaboo Expedition 2000, and I believe that we all agree that the mission was a complete success. Not only did we witness the late night takeoff of an unidentified aircraft from Groom, but we all made some new friends, and we could not have asked for a better group to share this experience with. Thank you all, Bill, Chris A., Chris M., Connie, David, Diane, Doug, Guy, Keith, Linda, Michael, Mike, Patricia, Rino, Sharad and Thompson. 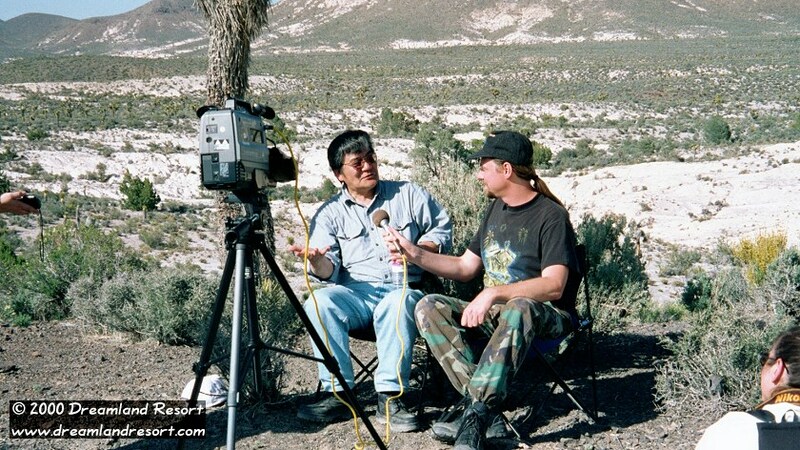 And special thanks to Norio Hayakawa, Peter Merlin and Chuck Clark for sharing their expertise on Area 51 with us, to my friend Andre Dall'au for making this trip possible, and to Connie for writing this excellent article. Meet the group: Standing: Doug, David, Rino, Michael, Thompson, Connie, Linda, Chuck, Chris M., Sharad, Chris A. Sitting: Diane, Bill, Joerg, Guy, Mike. On all fours: Snickers and Big Dog. We sought, we came, and we conquered. -- Tikaboo Peak that is. 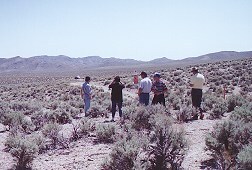 Why would a number of folks from various parts of the country gather in a remote part of the Nevada desert to hike up a mountain? Because it's there. No, not the mountain, but the view from the top. 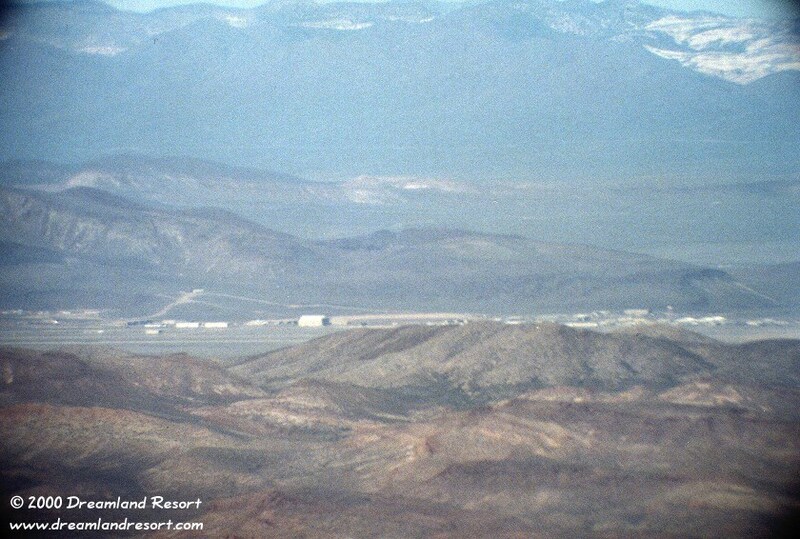 Whatever you desire to call it, Dreamland, Area 51, the Box or Groom Lake, it's been the subject of many late night talks and speculation among those wanting to know what really goes on there. What kinds of top secret projects are going on? Is there a group of mad scientists with frizzy hair working on something out of this world?" 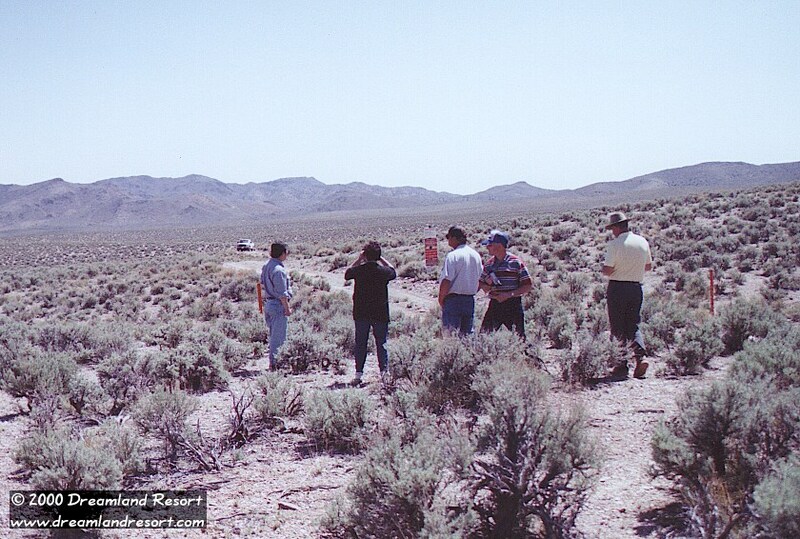 In April, after almost a year of planning, a group of about 20 souls converged in Rachel, Nevada for the Dreamland Resort Tikaboo Expedition, 2000. Rachel is the virtual melting pot for aircraft aficionados, stargazers, researchers and UFO seekers. The expedition was put together by Dreamland Resort founder and webmaster, Joerg Arnu with the assistance of Andre Dall'au of Florida. Rachel's own Chuck Clark was our guide. We also had the pleasure of being joined by former researcher Norio Hayakawa for a portion of the trip. 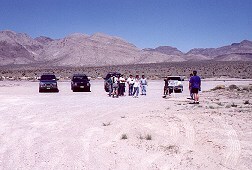 A mixture of people met from as far away as Pittsburgh, Chicago, Florida and Tennessee to as close as Las Vegas, Reno, San Francisco and Los Angeles. Ages ranged from the youngest age 12 to 40 plus. Our common goal - to hike up the "hill" and get a glimpse of the base. 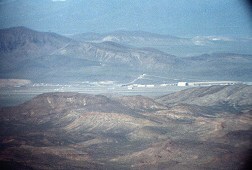 Tikaboo, some 25 miles away from what the government calls "an operation near Groom Lake, Nevada" is the closest peak now that affords a view to those willing to make the trek up to the top. White Sides Mountain and Freedom Ridge, popular viewing points about 12 miles from the base was seized by the government in 1995 after much public protest. 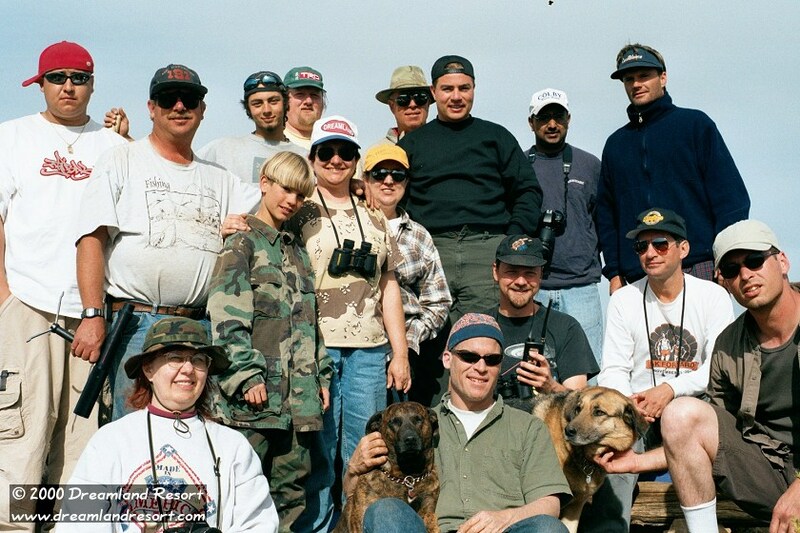 Some of us met in Rachel a day or two before the hike, where we spent time gawking at the night sky, watching military aerial exercises enhanced by flares and of course, getting to know one another, anticipate the hike and speculate. 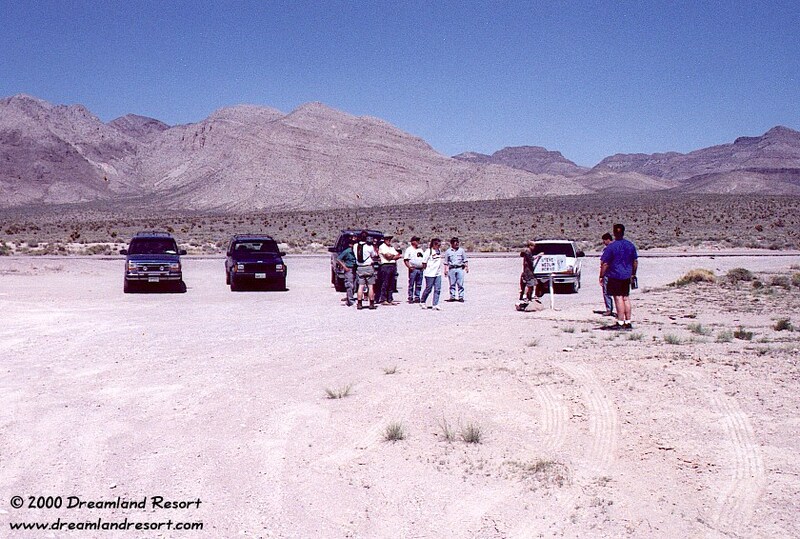 The day prior to the hike, Clark lead us to a number of "tourists" stops in the valley, including the Rachel Back Gate, Groom Lake Road, and the base of Bald Mountain. A caravan of-four vehicles roamed the valley all day. It must have kept military surveillance busy. 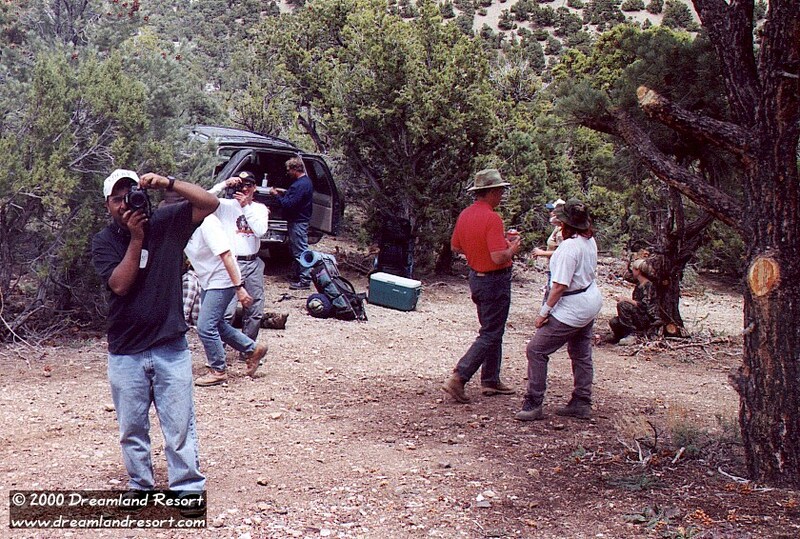 At Bald we parked a short distance from the border signs and pulled out cameras, video equipment, tape recorders and binoculars. Bald boasts a 150-foot tower with microwave and high frequency antennas. The high technology surveillance devices can even hear what occupants are saying in vehicles on the highway, said Clark. "The vibrations are picked up and translated into voices," he said. And of course, the cammo dudes are equipped with the parabolic "big ear." They can hear conversations of people milling around the border signs. To the uniformed, we could have been similar to a "tourist" group, minus Hawaiian shirts, much like the tours that take sightseers on whirlwind bus trips to see 14 countries in 10 days. Only we were seeing restricted area border signs, surveillance cameras and cammo dudes in one day. "This is like a pilgrimage for me, said Chris. "I grew up in Burbank, near the Skunk Works (the famed aerospace company that found Groom Lake, and with the CIA's money, tested top secret aircraft such as the U-2, A-12, the SR-71, the stealth fighters and bombers). "The area has put in effect a lot of nostalgia for me," said Chris. "It's like coming full circle." Some of us anticipated a visit from the famed blackhawk helicopters. We thought we heard a faint hum, but alas we waited in silence with no results. 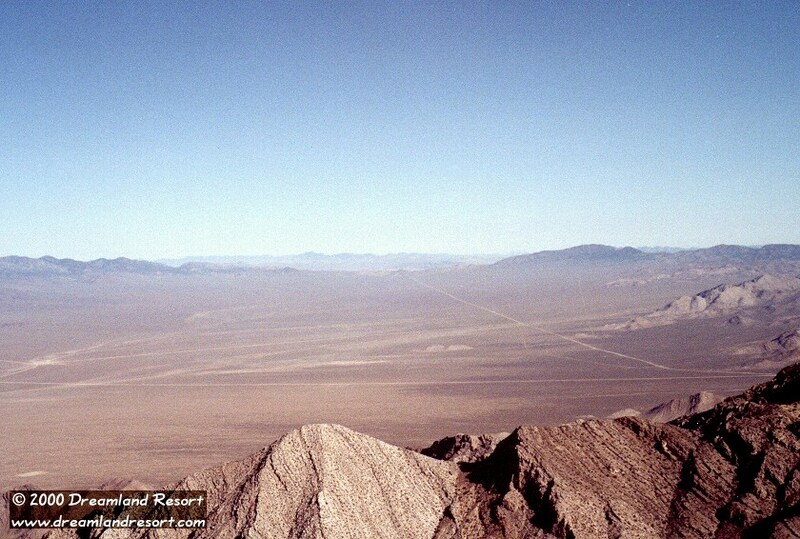 We drove back to the highway and the 13 miles up Groom Lake road to the border signs. We all made ourselves at home under the watchful eyes of the cammo dudes. Joerg, Andre and our photographer, Patricia set up a portable studio to conduct interviews with members of our group. White Sides Mountain provided a marvelous backdrop. Individuals gave their views and insights on what they thought was transpiring at the base, the issue of worker safety as well as opinions on the extraterrestrial connection. 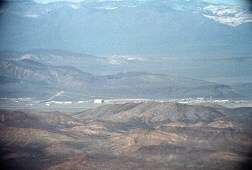 The common conclusion-Area 51 is a top secret test facility. "There's no doubt there's operations go on there," said Norio Hayakawa. "There's been improvement on the runways, roads have been repaved and of course, with the new satellite photos you can see numerous vehicles parked at the base," he said. Some agreed that while the government should keep some things secret in the interest of national security, they must be held accountable for illness and deaths imposed upon base workers and their families. There has been little compensation to workers and their families who have suffered. "The government should own up and do the right thing," said Clark. 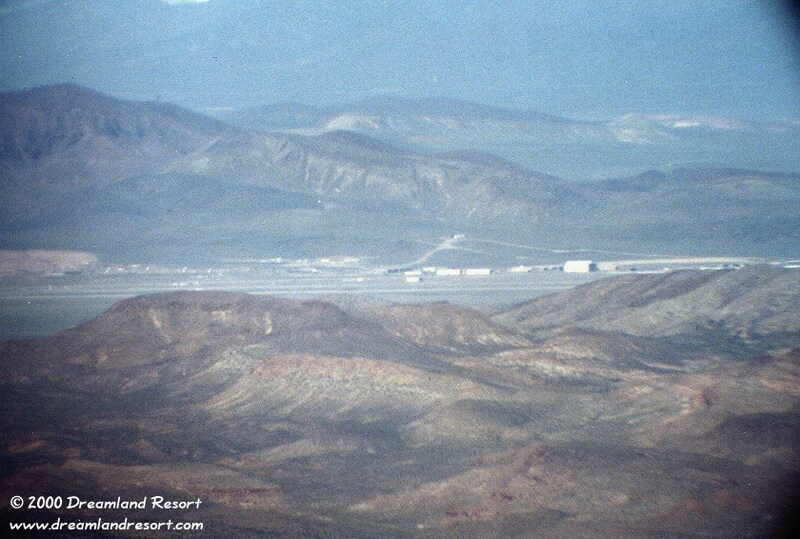 Some speculated on the presence of alien technology at the base. Although many believe Groom is a routine testing facility, they also think there's more advanced experimentation going on about nine miles south at Papoose Lake (aka S-4). "There's technology that is not in compliance with Einstein's or Newton's theories," said Clark. "It breaks all the laws of physics." Perhaps others are visiting us from our future or another dimension. "It's anybody's guess what's going on out there," said David. "There's no real evidence that there's alien technology," he said. "There's a mystery and enigma about this place." One small group including Andre, Michael, Chris and Joerg ventured up Hawkeye Hill to get a look at the guard shack located about 1/2 mile from the border signs. They were surprised to see the cammo dudes only a few dozen feet away. "We could overhear their radio traffic," Dall'au told us later. "Another more aggressive cammo in a Jeep radioed in our license plates as he checked out our vehicles parked down the road." The cammos in the pick-up nearby warmly waved to Michael and Andre as they departed. Later, a number of us stood by as the white bus transporting base workers swiftly drove by on Groom Lake Road. The next day, after loading up our vehicles and eating a hearty breakfast we set out on the road to Ash Springs, our final stop in civilization before heading towards Tikaboo. The road leading to Tikaboo is not recommended for regular cars. Four-wheel drive with high clearance is extremely advisable. Two vehicles suffered flat tires. But with the support of group members the flats were quickly repaired and we were on our way to the "parking area." Upon arriving we were met by a conspicuous white Jeep Cherokee. A man with a wide brimmed hat, adorned with a smart camouflage ensemble was standing outside the vehicle. No he wasn't a dude. He was Pete Merlin, aerospace archeologist and former Groom Lake Interceptor. Merlin, of course, said the similarity with the cammo jeeps did not affect his decision when purchasing the vehicle (?). Only a few SUV's made it up the last leg of the road. Big Bertha, our Chevy Tahoe, had a close encounter with a pinion tree and was forced retreat at the bottom of the hill. The first leg of the hike was, to put it mildly, arduous, even for those in fairly good shape. The grade was laden with loose shale and talus making it difficult, and at times almost unbearable for some of us. Bill, one of the group members brought his two dogs. They seemed to have no trouble scampering up that hill. Dogs have it pretty easy is this life----.even going up Tikaboo. My son, Michael was much further ahead with Merlin and Chris. Some of us took our time. Although we got a late start, there was still plenty of daylight left. Fortunately, the weather was on our side ...about 70 degrees. The occasional breeze provided comfort to our sweaty brows. We were glad for a reprieve when reaching the saddle. This portion lead to a more vertical ascent, but in my opinion much easier than the first part. It was steep, but the large boulders and rocks are embedded in the ground, which make for better footing. Upon reaching the top we found the others relaxing as though they've been at the summit for hours. Michael, Merlin and Chris were settled comfortably on the makeshift bench, chatting and looking as if they were waiting for afternoon tea. The view from Tikaboo is spectacular. Although challenged with afternoon haze we could see Dreamland. "I'm actually looking at this famous base," was my first thought. 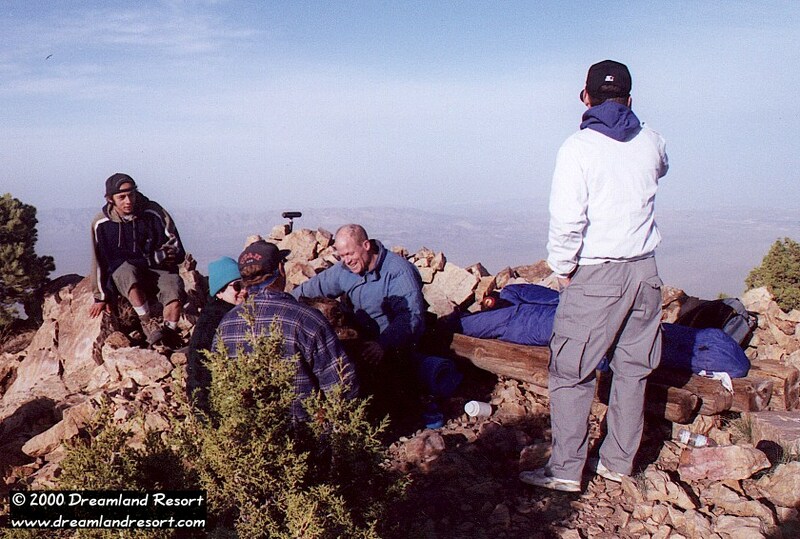 The mountaintop provides a panoramic view of southern Nevada's vast desert and hills. "Even if the base wasn't there it's still a beautiful view," said Guy. The desert has a special beauty of its own. I won't deny it's brown, but it is full of life. Standing on that mountaintop made me feel small-not in a negative way, but I thought, here's just a small portion of the world and the universe, but it's such a BIG small portion. 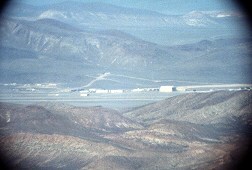 And nestled about 25 miles away from us is the base so secret that it is known the world over. No doubt, there were some who wish they had a cold beer, glass of wine or a hot cup of latte to savor the moment, but who would've wanted to carry all that? We had no trouble indulging in MRE's, power bars and water. We all made it. What a team! 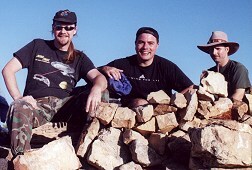 Most of the group sat atop the mountain, speculating while marveling at the gorgeous sunset. As night fell, some retreated to their campsites. Precisely at midnight those still at the top, braving the winds had a treat. 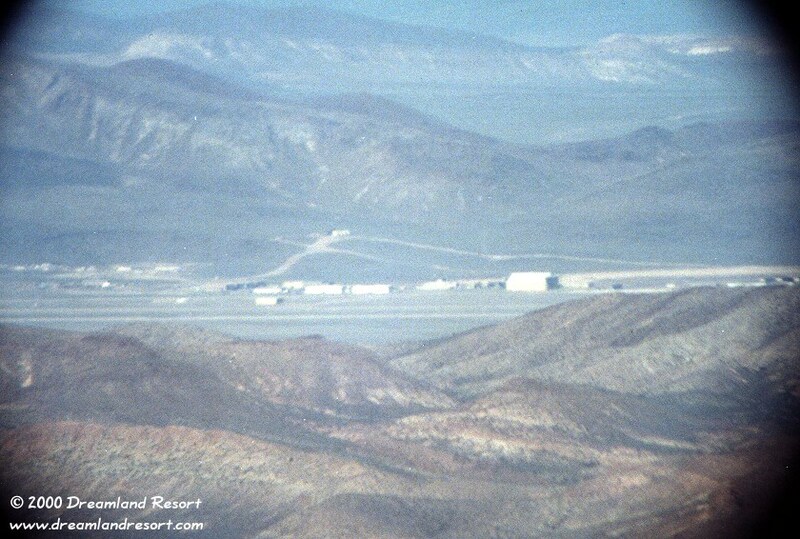 Groom Lake's runway lights came on. Some of us quickly exited our sleeping bags, joined the others, hoping to get a glimpse of "something." There was an object at the south end of the runway and it appeared to be very large. There was a sense of busy, anxious conversation amongst us as to what this was. At 12:37 an aircraft sped down the runway and took off. Its navigation lights quickly darkened. That moment was the last we saw or heard it. In the morning with scanners ready we heard an aircraft take off with the same call signs as the one the night before. Shortly thereafter, an aircraft was spotted to the south. After much debate, emails and discussions there still is disagreement as to what this aircraft was. A MiG 23 Flogger perhaps. That's some of the opinion, but there is still no complete agreement. I'm going deem this aircraft a P.I.F.O (Partially Identified Flying Object). Pronounced: pie foe. Whatever that craft was and whatever we saw at the other end of the runway confirmed my belief, that, yes, there is activity going on there. It's up to others to decide what they think it is. 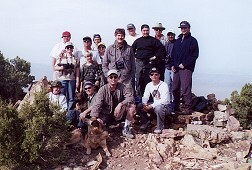 As we hiked down that morning, we all agreed on one thing: How in the H$#L did we get up this mountain? Although the descent was considerably faster, we still gingerly chose our steps as we made our way down. Some of us opted to slide on our behinds when confronted with the shale at the lower portion of the mountain. Back by the vehicles. And no one thought of bringing a cold beer! Once reunited with our vehicles we savored a cold drink and relaxed a little before making the trip back to Ash Springs. Some of the group members said their good-byes there. Those of us fortunate to spend a few extra days in Rachel enjoyed exploring the sights and sounds of the desert. The Tikaboo Expedition 2000 group was comprised of a broad selection of souls, but we all have one thing in common. 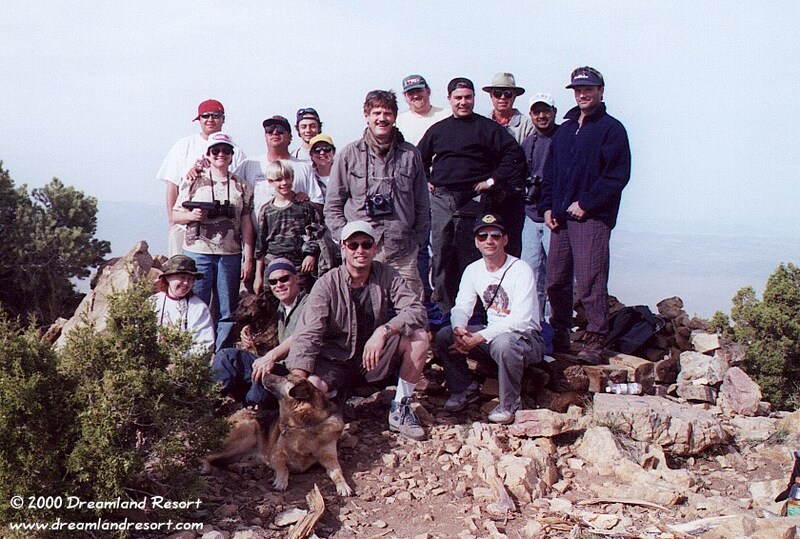 This similar longing and adventurous spirit brought us all together in a small corner of the Nevada desert to see what's out there. I am angry and saddened by the illnesses and deaths fallen upon base workers and the lack of accountability from the government. Yes, they did sign away their rights, but a line has to be drawn somewhere. As a reporter I want to know everything. I want to hunt and capture the answers. It's frustrating to be standing at the border signs or looking at the base from a mountaintop and not knowing everything, but the excitement of the hunt is sometimes what it's all about. We'll be there again soon! Photos by Andre M. Dall'au and Joerg H. Arnu.